Inside The Market: Intermarket analysis : focus on luxury sector. Intermarket analysis : focus on luxury sector. About the relative performance, a year now, the stocks that have performed better are : Kering, Brunello Cucinelli, Hermes, Burberry, C. Dior, Moncler, M. Kors and LVMH. In the middle, we have : Salvatore Ferragamo, Yoox-net-a-porter, Prada, R. Lauren, Tod's and Luxottica. The worst are : Safilo, Hugo Boss and Geox. About the risk, the luxury sector is an industrial, by definition. 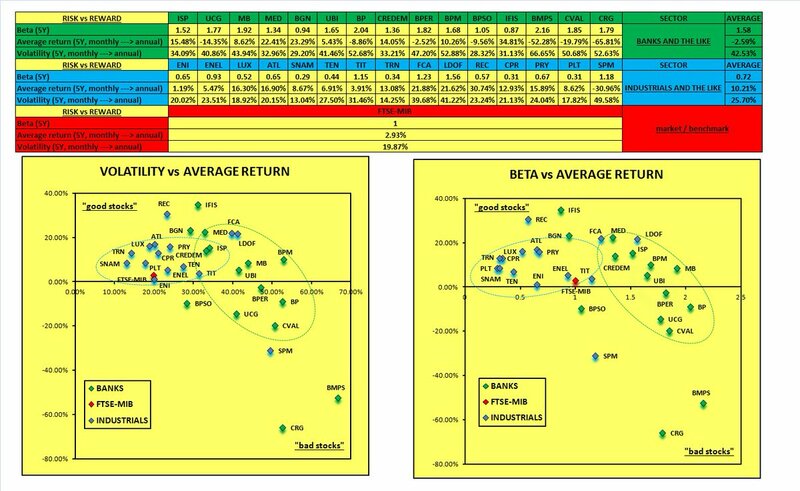 It provides low risks (individual, volatility and systematic, beta) in the face of good average returns, compared to banking and financial sector. The last one is far riskier with disappointing returns, over the long-term. The luxury stocks and industrial (in general) are more likely to the investor instead banks are best suited to the pure trader. 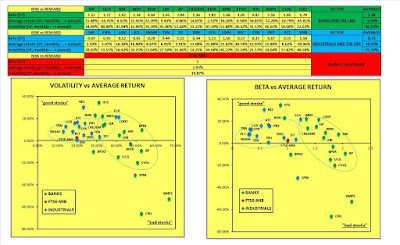 As shown in the following chart, the industrial (green) is in the upper left (high returns, low risks and the financial (light blue) is in the lower right (low returns, high risks). The following graph shows risk-reward among the luxury industry, with a time frame of one year (252 returns). 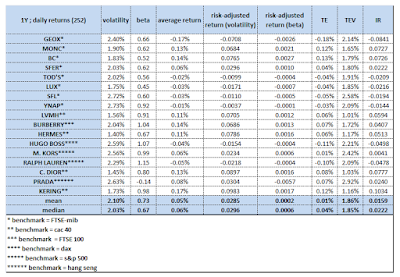 All in all, the intraday volatility is low (about 2%) and the same, for the beta (about 0.70), with some outsiders (downward) like Luxottica (1.75%) or C. Dior (1.45%) and (upward) Yoox-net-a-porter (2.73%) or Safilo (2.72%) ; with regard to the market risk (downward), Brunello Cucinelli (0.52) or Luxottica (0.45) and (upward) R. Lauren (1.15) or Hugo Boss (1.07). 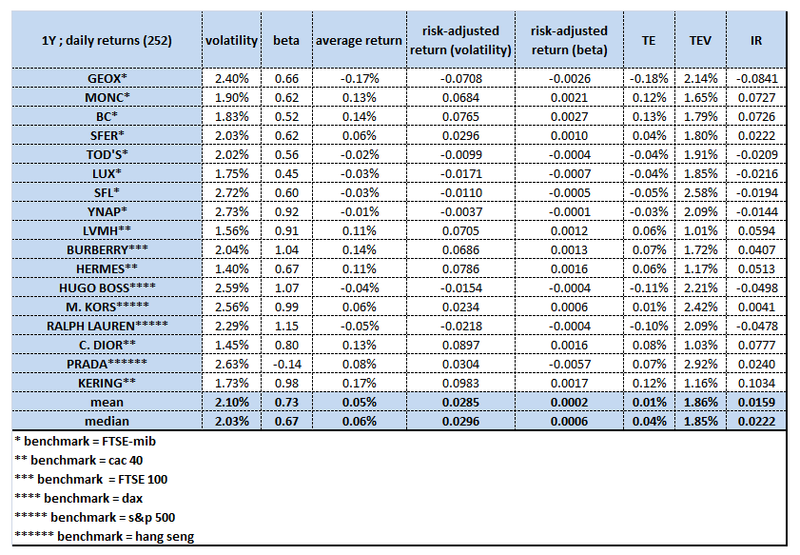 There are also the comparative returns (TE, TEV and IR=TE/TEV), related to the specific benchmarks : Ftse-mib (ITA), cac 40 (FRA), Ftse 100 (GBR), dax (GER), s&p 500 (USA), hang seng (HONG KONG). The best is Kering, the worst is Geox. Geox is very interesting : there is a huge "performance gap" to cover and, with regard to the business plan and other expectations, at the current prices, it could be an opportunity (see my previous post, dated December 26, 2016, http://michelecarollo.blogspot.it/2016/12/geox-spa-business-turnaround-bp-drivers.html).